A few years ago, I was asked to speak at two different churches in two different cities on the same Sunday morning. Both of these churches were located in remote farm land just outside where I live. Since my GPS wouldn't work in these areas, I was given turn by turn written directions for the first church that I was to speak at and was told that I would get the directions for the second church when I arrived. Since I only had 15 minutes to get from the first church to the second church and it was a 15 minute drive to get there, I felt quite pressed for time! With no idea how to navigate the country roads and no written directions on how to get to my next speaking engagement, I was feeling a little stressed. One of the elders in the first church saw my stress level rise when she was trying to verbally give me directions. I must have been looking at her with a blank stare because she kindly offered to lead me there in her own car. I was quite relieved and gladly accepted her offer to lead the way. It was a beautiful Sunday morning, the sun was shining, we were driving past beautiful corn fields, and everything felt perfect. I wasn't stressed because I knew that the lady driving in the car in front of me knew where she was going. I didn't have to watch out for street signs, I didn't have to worry about speed traps, all I had to do was follow her. Because I was confident that she knew where she was going, I had the opportunity to enjoy the rich scenery that we were driving through. This feeling of bliss contrasted the stress I felt earlier in the morning when I was trying to follow my hand written turn by turn directions to get to the first church. Since I was being led, my only responsibility was to simply follow. It was at this moment that God spoke to me and said these words... "Barry, this is how it feels to be led by the Spirit". I immediately understood what the Lord was saying to me. When we are led by the Spirit of God, we do not have to worry about where we are going. We do not have to try and chart out the turn by turn directions in life. All we have to do is to simply follow. When we are following the prompting of the Holy Spirit, we can enjoy the scenery along the way because we do not worry about getting lost. 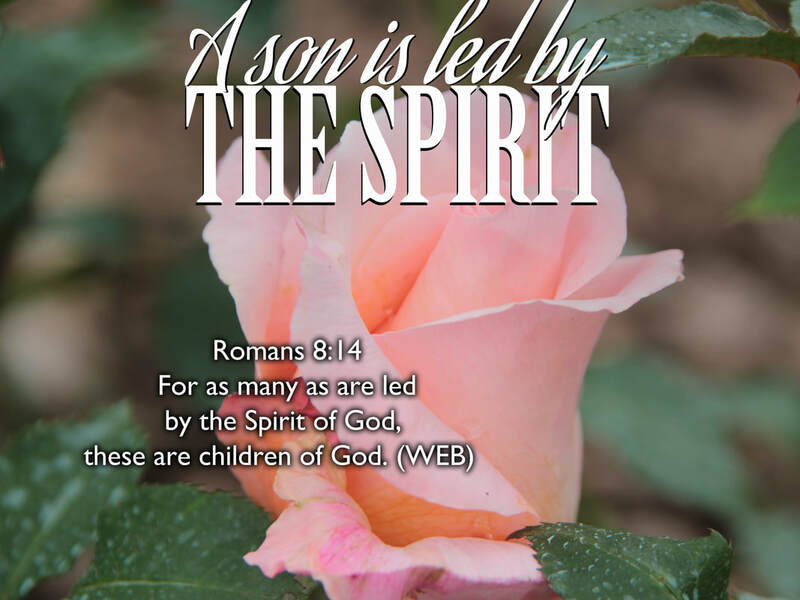 In this week's blog, the passage of Scripture from Romans 8:14 tells us that one of the signs of sonship is learning to be led by the Spirit. It might sound simple enough, but in an orphan world system that celebrates independence, the idea of allowing ourselves to be led, can be quite a challenge. If someone else is leading us, then our only responsibility is to follow. When the Spirit moves, we move. When He stops, we stop. In order for us to be led by the Spirit, we must surrender our own agendas and independence and simply trust in God's goodness to take us where He wants us to go. When we are led by the Spirit, we simply settle in to being the branch that Jesus speaks about in John 15:5, where He tells us that He is the vine and apart from Him, we can do nothing. If we look at the natural life of a vine and its branches, we will understand that there are indeed seasons of growth and seasons of rest. It would not be appropriate for the branch to try and work itself into a frenzy of fruitfulness in the winter season of dormancy. If it works that way in creation, how much more should we live in the ebb and flow of the seasonal life that comes from the Spirit's leading in our lives? But sometimes that is easier said than done. In my own life, I am learning how to follow the Spirit's lead in completely new ways than I would have ever imagined just a few years ago. I will admit that it has not been easy for me, but I am slowly learning what it means to be led. Having a 'type A' personality, I have always believed that initiating is always better than waiting. But the truth is, to be led by someone, is to learn to live in a posture of waiting to be led and that requires an element of humility. One of the big 'hot button' issues that is usually dealt with in this journey of learning to wait is the broken view of our personal value that is based on our productivity. If we see ourselves as only valuable when we are producing, then the winter seasons of rest will be really hard on our psyche. If we think that our Father only notices us when we are accomplishing greats feats in the Kingdom, this will lead to a restlessness that may produce wood, hay and stubble instead of the really good stuff. Learning to be led definitely goes hand in hand with waiting on and for the Lord. The first part of verse 7 in Psalm 37, says... Be still before the LORD and wait patiently for him. Verse 34 in the same chapter King David says... Wait for the LORD and keep his way, and he will exalt you to inherit the land; you will look on when the wicked are cut off. (ESV) Isaiah 40:31 tells us that those who wait on the Lord will renew their strength. They will even mount up with wings like eagles and never tire! In my own personal journey of learning to be led, I inevitably get to the place where I ask the question... "How long do I wait?" And the answer that I have always seem to hear from the Lord is... "As long as it takes!" Oftentimes, especially in Kingdom pursuits, we can forget that patience is one of the fruit evidences of the Holy Spirit in our lives (Galatians 5:22-23). If I embrace a lifestyle of being led by the Spirit, then I will need to embrace a posture of waiting to be led as well. When the Spirit moves, I move. When the Spirit stops, I stop. Make sure you get that last part... When the Spirit is not leading you to action... Be still and know that God is really God (Psalm 46:10)! While this has been a difficult and painful process for me to learn, I am slowly but surely, grasping the glorious freedom found in being led. Being led by the Spirit frees up my mind carrying the responsibility of trying to discern the road map for my life. Being led by the Spirit frees me up to be able to live in the moment rather than to be constantly thinking about the future. Being led by the Spirit allows me to embrace a simple life with the heart of a child who calls out to his Father from the back seat of the car... "Are we there yet?" My prayer today is that we would all see the amazing benefits of being led by the Spirit. May the Lord restore our ability to trust in His leading so that we don't lean on our own understanding (Proverbs 3:5-6). May we all find the courage to lay down our own agendas and surrender to the loving leading of the Holy Spirit. May we all find a new freedom in our hearts today that allows us to simply live in the moment, rather than to live in the future. I pray that we will all be able to embrace the heart position of learning to wait on the Lord so that our strength can really be renewed. And last but not least, may we all see the glory and the fruitfulness that awaits everyone who simply takes their place as a branch that has unlimited access to the richest, life-giving vine imaginable (John 15:8).